AS4324.1 Mobile Equipment for Continuous Handling of Bulk Materials Part 1 is the standard for the design of mobile equipment for continuous handling of bulk materials such as excavators, stackers, reclaimers, ship loaders and ship unloaders. One of the changes in the recent published AS4324.1:2017 from the previous version of the standard (AS4324.1:1995) is the revision of the limit state design (LSD) requirements that are compatible with the loading requirements in AS/NZS1170.0. The LSD method in AS1170.0 adopts partial load factors to take into account the different level of uncertainties in different load types, and AS 4324.1:2017 has adopted the partial load factors that are consistent with those in AS/NZS 1170.0. ASPEC has completed a study with Dr W.H. Kang to evaluate the reliability of steel columns using load factors provided in AS 4324.1:2017. 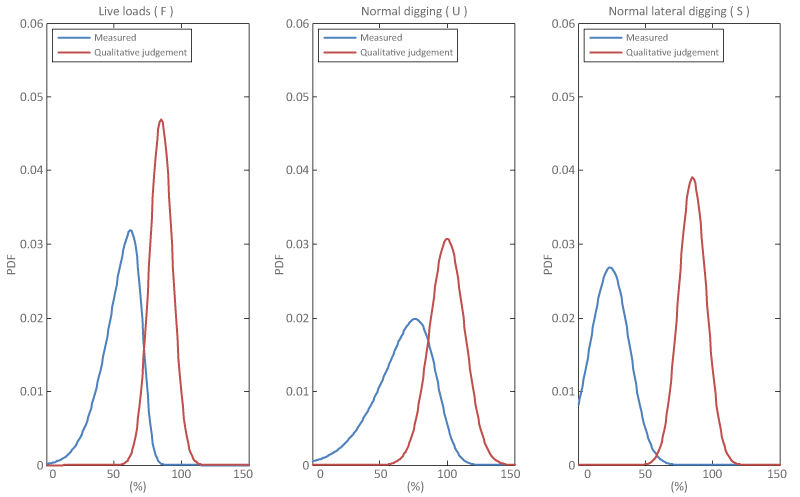 The reliability model is based on the proposed probability distribution of design parameters (Figure 1) based on experience. For example, it is assumed that majority of time the machine is doing 85% of design throughput (Live Load F, mean 0.85). 650t Iron Ore Ship loader, 49m boom, 7,700 tph design throughput. The load data was calibrated against strain gauge data and was found reasonably accurate. 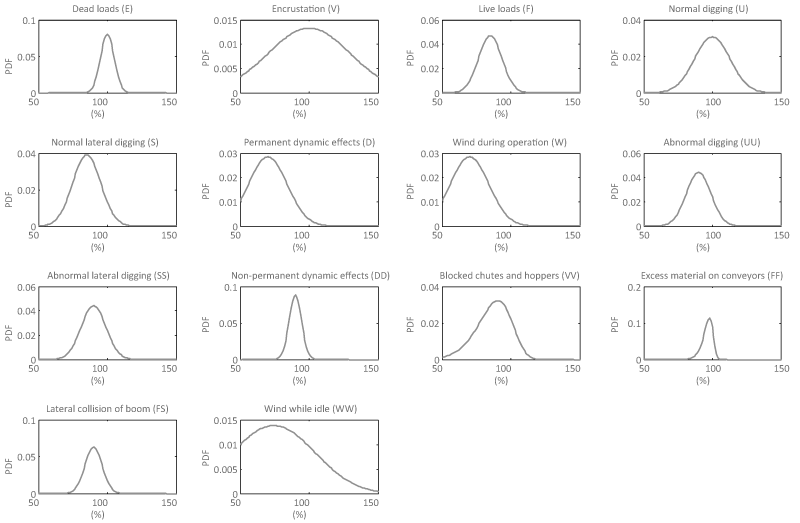 The comparison of these two sets of distributions for F, U, and S obtained from measured data and qualitative judgement is provided in Figure 2, and it was found that the proposed distribution of design parameters is more conservative than with the site measured data. Kang W. H., Uy B., Hawkes D., and Morgan R.: Reliability analysis for load factors in steel bulk material handling structures with respect to AS4324. 1. Australian Journal of Structural Engineering, 17(2): 99-108, 2016.